Rate Of Change (ROC) Divergence Indicator Generation III is modern indicator with complex mathematic algorithm (BJF Trading Group innovation). You will see divergenses on the chart and indicator. Arrows painted above/below the open bar and not in the past. You can see when actually you can trade. It is never to late! Signals based on closed bars so the arrows above/below open bar never disappear. 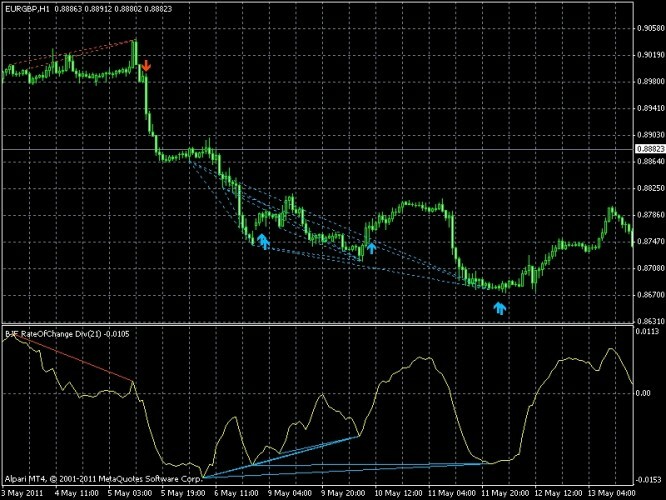 MT4 Indicator Rate Of Change (ROC) Divergence indicates fractal divergence by Rate Of Change (ROC) indicator.When divergence appears between ROC Indicator and the price, it indicates a high probability that the current trend will finish soon. A signal to buy is when a new Low-fractal is formed below the previous one and a corresponding Rate Of Change value is higher than the previous one. A signal to sell is when a new Up-fractal is formed above the previous one and a corresponding Rate Of Change (ROC) value is lower than the previous value. The indicator ROC has a lot of customizable settings. Trader must choose the time window that he or she wishes to use. As with most every oscillator, it is generally a good rule of thumb to keep the window narrow. Oscillators are most useful in detecting short-term changes in the markets, perhaps within a time frame of a week; while trend-following indicators are better employed for longer-term trends. When RoC rises to a new peak, the optimism of the market is growing, and prices are likely to rally higher. When RoC falls to a new low, the pessimism of the market is increasing, and lower prices are likely coming. When prices rise but RoC falls, a top is likely near. This is an important signal to look for when locking in your profits from long positions, or tightening your protective stops. If prices hit a new high but RoC reaches a lower top, a bearish divergence has occurred, which is a strong sell signal. The corresponding bullish divergence is an obvious buy signal. In terms of market psychology, the momentum and RoC oscillators compare today's consensus of value to a previous consensus of value, thereby measuring demonstrable changes in the market's mass optimism or pessimism. These oscillators are powerful leading indicators that guide the trader on not only the market's future direction, but also its speed. When combined with demonstrable divergences, RoC can precisely ascertain the very moment the market shifts direction. Markets are always divided into bullish or bearish camps, and the astute trader need only determine the relative strength of each to identify "who's got the power."